Cornbread is a southern staple that every cook should have a good recipe for. I grew up eating cornbread on a regular basis. Sometimes it was with a pot of beans for dinner, with barbecue at the lake, paired with chili on a cold night, and of course, always the base for Thanksgiving dressing. My mom always made the Betty Crocker cornbread from the little pouch. It was super easy to throw together and much better than store-bought for sure, but not quite homemade. So I had to come up with this cornbread recipe on my own. Many cornbread recipes are either loaded with sugar, drenched in butter, or both. And while those recipes are certainly tasty every once in a while, they’re not necessarily the kind you want to eat often, as they will likely make you feel a little sluggish after a while. 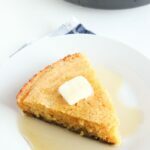 This recipe keeps the sweetness and flavor of good Southern cornbread, but it is lightened up a bit with Greek yogurt and whole grain flour. Side note – Did you know that cornmeal counts as a whole grain? Now you do! Back to the cornbread recipe. This skillet cornbread is simply delicious. Not too dry and crumbly, but not too light and fluffy either. It’s the perfect combination of a crusty outside and a sweet, dense inside – it’s everything you want cornbread to be! If you’re feeling festive, you can add corn, onions, jalapeños and cheese to the batter for Mexican cornbread, but it’s just as delicious with a drizzle of honey or crumbled into a bowl of chili. And you bet I’ll be making this recipe a couple of days before Thanksgiving for some epic cornbread dressing! Preheat oven to 425° F. Put skillet in the oven to preheat. In a large bowl, combine dry ingredients. In a medium bowl, combine buttermilk, egg and yogurt. Stir into dry ingredients until just combined. Remove hot skillet from oven and add butter. Let butter melt and carefully turn the skillet so that it is coated with butter. Pour batter in and bake 20-25 minutes or until a toothpick inserted in the center comes out clean. Yay! We love our cast iron skillet! Yes, perfect with chili! What size cast iron skillet would you use for this recipe? Hi Barbara, I use a 10″ skillet, but one slightly larger or smaller would also work! Enjoy! Hey Kaleigh, thanks so much! Can you just use cake pans for this super great corn bread. I don’t have cast iron pans any longer, switched to stainless steel because they are much lighter. Yes, I think cake pans will work fine. Thanks for stopping by! VERY good. Light texture, moist. My new go-to recipe for corn bread. Thank you! I made muffins. Baked muffins at 400 for about 15 min. Turned out perfectly! Hi Jen! Thanks so much, I’m so glad you liked the recipe. The muffins sound great! Thanks for stopping by!